By now, many recognize the difference between a healthy acute inflammatory response versus an unhealthy persistent one. Acute inflammation is a necessary and vital short-term immune response to an injury, pathogenic invasion, damaged tissue, or toxic chemical effects. 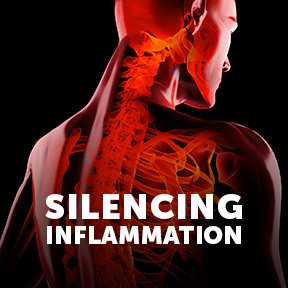 Systemic low-grade chronic inflammation is a long-term health damaging and unnecessary inflammatory response that can continue unnoticed and unabated for years. This prolonged state of emergency keeps the immune system’s first responders on high alert, eventually triggering disease processes that can cause lasting damage to the heart, brain, blood vessels, joint, cells and other organs. Researchers continue to study the effects of chronic inflammation to seek an understanding of triggers that in some cases cause the body to attack its own healthy tissues. More than eighty autoimmune diseases have been identified, including rheumatoid arthritis, lupus and multiple sclerosis. Genetics may play a role, as autoimmune diseases tend to run in families, and women, in particular, have a higher risk for developing certain autoimmune conditions. Depending upon the disease, flare ups may be followed by periods of time when uncomfortable symptoms may temporarily subside. The ultimate goal of treatment is to reduce symptoms, control the autoimmune process and maintain the body’s ability to fight disease, as when the immune system is overwhelmed, it will prioritize defense over repair. Visceral fat: Deep belly fat is thought to be a major cause of inflammation, as metabolically active fat cells release numerous hormones and chemical messengers that can lead to leptin and insulin resistance. These factors also ultimately contribute to increased appetite and fat accumulation, and consequently even higher levels of inflammation. Gluten: Foods that contain wheat, including durum, rye, barley and ancient grains, as well as beer and malt beverages, can cause an immune response in those with sensitivities, allergies or celiac disease. This includes bakery goods, pasta, cereal, soy sauce, pretzels, tortillas, salad dressings, veggie burgers and many other products and condiments. Eliminating gluten from the diet helps to calm inflammation in many people. Dairy and casein: As numerous food allergies result from specific types of proteins, those who are sensitive to casein proteins found in dairy, or who are lactose (milk sugar) intolerant should eliminate dairy from their diets. Casein allergies or intolerances can result in gastrointestinal problems, joint pain, fatigue and behavioral changes. Eliminating dairy/casein from the diet also means eliminating a top source of calcium. Green leafy vegetables, bone broth, and dried fruits all provide a rich source of absorbable calcium for those excluding dairy. Be sure to include foods rich in vitamins K1 and K2, which are essential for calcium utilization, such as fermented foods and greens. Sugar: Research has confirmed the link between added sugar and higher inflammatory markers, like C-reactive protein. A diet high in refined carbohydrates and added sugars can lead to obesity, insulin resistance, increased gut permeability, oxidative stress, and chronic low-grade inflammation. Additionally, the risk of developing heart disease, cancer, diabetes, arthritis, mental decline, and other chronic diseases increases with excess sugar consumption. Natural sugars found in fruits and vegetables have not been linked to inflammation, and many, in fact, may be anti-inflammatory. Read food labels. Look for hidden sources of added sugar in processed foods, flavored yogurts, and cereals, as well as more obscure sources of gluten, such as brewer’s yeast, oatmeal, sausages and candy. Eat more vegetables and fruits that contain fiber, antioxidants, vitamins, and minerals to combat and reduce inflammation. Regularly consume anti-inflammatory spices, including turmeric, garlic, ginger, cinnamon and cayenne pepper, to help reduce symptoms of pain and inflammation. Used traditionally in Ayurvedic medicine, turmeric helps control inflammation, and has shown some potential against inflammation linked diseases such as diabetes, Alzheimer’s, rheumatoid arthritis and ulcerative colitis. Regularly consume antioxidant-rich foods such as nuts, beets, cruciferous vegetables, berries, leafy greens, cherries, and artichokes. Numerous plant bioactive components have been shown to have pharmacological properties that counteract various acute and chronic diseases. Per the National Institutes of Health (NIH), the impact of oxidative stress and resulting free radical production can lead to imbalances of enzymatic processes, resulting in cell damage and health issues. Insufficient antioxidant compounds in the daily diet can lead to the development of degenerative diseases, including cancers, cardiovascular diseases, Alzheimer’s, neurogenerative diseases and inflammatory conditions. Exercising regularly and effectively managing stress levels can also help fight inflammation. Stress can be particularly harmful when it comes to inflammation, as it can alter gene expression in immune cells, making them more likely to attack the body’s own tissues. Maintain a healthy weight, as obesity triggers a cascade of cellular inflammation that leads to metabolic conditions including insulin resistance. Losing excess body fat helps to normalize blood sugar levels, reduces inflammation and, in some cases, results in type 2 diabetes reversal. Be moderate in alcohol consumption, as alcohol is a known contributor to many diseases and disorders some of which are linked to inflammation. Heavy drinking can lead to a condition known as “leaky gut” that can drive widespread inflammation and lead to organ damage. Make an all out effort to cease smoking. In addition to causing morbidity and mortality, cigarette smoke causes diverse changes in immunity that lead to increased inflammation, impaired immune response to pathogens, and suppressed anti-tumor immune cell functions. Zyflamend™ Whole Body by New Chapter®: This 100% botanical full spectrum formula delivers turmeric, ginger, rosemary and other plant extracts in support of the body’s natural healthy inflammatory response, as well as the relief of minor pain or soreness associated with exercise. Naturally gluten free, Non-GMO vegetarian formulation. Boswellia-Turmeric Complex by Douglas Laboratories®: This product provides a synergistic blend of three standardized botanical extracts in support of a healthy inflammatory response and free radical protection. Includes boswellia, turmeric, and devil’s claw, which are beneficial for connective tissues, including joints, ligaments and cartilage. Free of yeast, wheat, gluten, soy, milk/dairy, corn, sugar, starch, artificial coloring, artificial preservatives. Non-GMO formulation. Vital Clear® by Vital Nutrients: This powdered formula provides 29 grams of non-GMO rice protein and pea protein isolate, as well as a full range of high quality naturally pure macro-and micro-nutrients. Vital Clear® supports healthy blood sugar maintenance, detoxification, and suppressed inflammation. Free of binders, gluten (wheat, rye, barley), milk/dairy (casein, whey), soy protein, egg protein, and sugar. Natural pineapple flavor. Homocysteine Response™ by Innate® Response Formulas: Skillfully crafted with organic whole food ingredients, this formula helps maintain healthy levels of homocysteine in the body. Elevated homocysteine levels are associated with fat accumulation, as well as tissue and organ damage. Provides specific vitamins, bioactive enzymes, trace minerals and branch chain amino acids. Gluten, wheat, soy, preservative and artificial ingredient free. Assayed for purity and potency. 12 Healthy Foods High in Antioxidants.